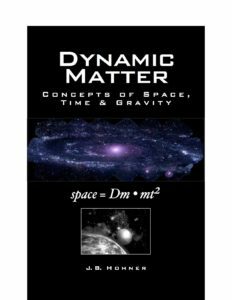 Introducing a new book that explores theoretical cosmological concepts and also goes deep within the atom. This is not just another book of theoretical ideas that only speculate and avoid the burden of empirical verification. The author isolates four momentum anomalies that exist in our physical world. The starting point is the Earth’s slowing rotation, which is about 1/2 second per year. This study is then extended to the two Pioneer space probes that have been slowing down consistently, even after departing the solar system, apparently in complete contradiction of Newton’s first law. The Moon is then studied. Ever since it was first visited by the Apollo astronauts, we have known that it is getting 3.8 centimeters further from the Earth each year. The fourth momentum anomaly that the author researches is the rotational velocities of galaxies. The galaxies appear to be spinning much too fast for the amount of matter they contain. Interestingly, the author has been able to mathematically resolve all four momentum anomalies with the initial numbers derived from the Earth’s slowing rotation. Is it possible for matter to be dynamic? By dynamics, we are talking about its volumetric dimensionality. The Universe was born from the Big Bang starting with an infinitely small singularity of matter. There is an assumption in physics that all matter of the Universe, in a brief flash, went from an infinitely small speck to maintaining a constant size for 13 billion years. Is it possible that following the Big Bang , matter did not assume a constant size, but started small and has been very slowly increasing in size for the life of the Universe? Could such a subtle variance in matter account for the momentum anomalies? The conclusions in this break through research appear to demonstrate the validity of this concept.